I finally started following my TimeZone School Level 1 course to disassemble an HMT movement. 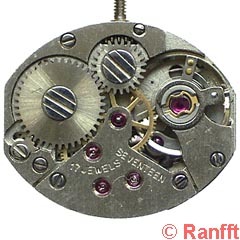 The HMT 0231 is very similar to the Fontainemelon calibre 97 (FM97). The big difference (actually fatal ) was that the screw holding down the ratchet wheel on top of the mainspring barrel was a left-hand thread. Why would the HMT copy of an FM97 be different? P.S. I wimped out on removing the trishock assemblies. It is not very common, but in some calbres the same screw is used for crown- and ratchet wheel, to reduce stock costs. Just remembered that I'd seen a thread a long time ago about about tearing down a HMT. Googled and found it. He also snapped the same barrel screw that I did. Although he actually knew which way he was supposed to turn it. The posting also confirms Roland's post - both crown and ratchet are left hand. I'm pleased with the Time Zone School lessons and I've got a couple more donor HMT's to hone my skills. 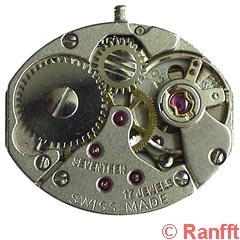 Many watches (especially swiss) use a left-hand screw on the crown wheel because the crown wheel only rotates counter-clockwise, and in simpler designs it would be possible for the friction between the edge of the crown wheel and the screw to actually unwind the screw. Of course, most of the better designs use some form of center post that isolates the two, but the tradition continues. 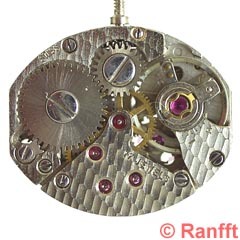 All in all, it can be a bit of crap-shoot deciding if the crown wheel screw is left or right threaded, and I'm sure many a screwhead has been sheared off by confused watchmakers faced with a tight screw on an unfamiliar movement. Some manufacturers use the helpful "triple notch" on left handed screws, but not all. In some rare cases, I've actually seen left handed screws used for both the crown and ratchet wheel. In some rare cases, I've actually seen left handed screws used for both the crown and ratchet wheel. Well, the new screw got just one slot to indicate the redesign. 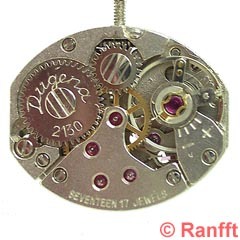 But now watchmakers used to the left-hand screws believed in replacement of a broken screw, and continued to crack scews - now by trying to loosen them clockwise. Finally, you never can be sure. My personal approach is: If the heads of both screws have different diameters, the ratchet wheel has reliably a cw thread. If both have the same diameter or even identical heads, it is a good idea, first try to loosen them cw. The Uncle Freddy Combo Tool with patent applied for battery powered torque sensing screwdriver has recently been retro'd with new V3.25 firmware to determine thread orientation.